Local radio station Y107 received more than 1.1 million votes and was named North America’s Most Caring Radio Station in a contest held by Foresters, a Toronto-based life insurance provider. The winner of the contest received a $50,000 donation to be added to its 2010 radiothon total for the Children’s Miracle Network. Y107 is owned by Zimmer Radio Group. Nicci Garmon, operations manager for Zimmer Radio Group, said they could have chosen any of their nine radio stations for the contest. “We picked Y107 because they had the biggest signal,” she said. Garmon said they entered the contest not thinking they could beat the larger stations in big cities. When they realized they had a chance, she said they did everything they could to get people to vote. Garmon said they got votes from around the nation and across the world. Zimmer Radio Group used all nine stations to promote the contest and used Twitter. She also said the staff at Zimmer Radio Group called everyone they knew no matter where they lived. “We were lucky that the newspapers, T.V news stations and the University of Missouri Health Care (UMHC) helped out,” said Garmon. 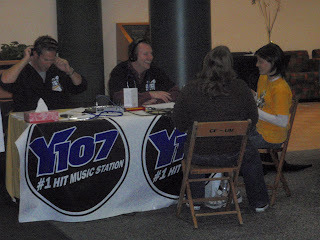 Y107 personalities Cosmo and JC broadcast live during the 2009 radiothon at UMHC. Photo courtesy of UMHC. 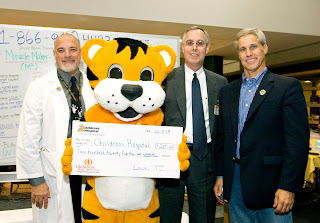 Radiothon check presentation to MU Children’s Hospital: From left, Timothy Fete, M.D., T.J., Jim Ross, chief executive officer of MU Health Care, and John Zimmer, co-owner of Zimmer Radio Group. Photo courtesy of UMHC.